We were not sure how it was going to go, but our campaign to raise awareness about prostate cancer in the community has been successful. It was a collaboration between Burton’s Queens Hospital and Burton Albion Football Club where the idea was to encourage as men over 50 years to have a prostate cancer screening. It is the most common cancer among men and yet there is taboo associated with cancer and many men just do not want to deal with the issue. After months of planning, we held a week of activities as Burton Albion. The football club has been so helpful and committed to the cause. There was an over 50s five a side football session attended by Burton Albion first team coach Andy Garner. I myself did a presentation on men’s health. 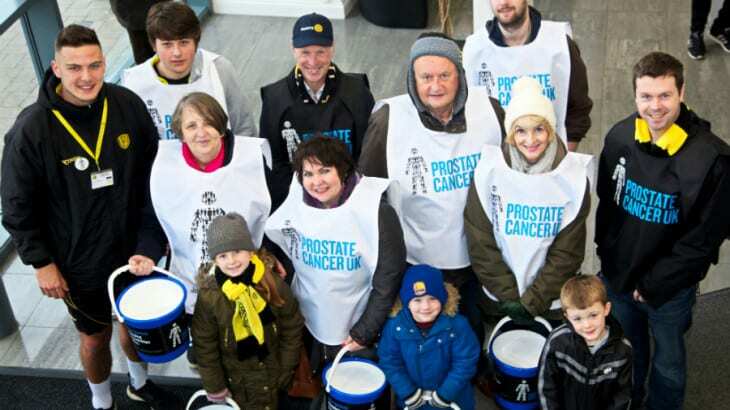 The Rotary Club of Burton helped raise more than £600 for Prostate Cancer at the Burton Albion match against Oldham Athletic. During the match my hospital colleagues (Sarah Minns, Tyra Stevens and Aimee Hassett) with the support of some of my patients we put up a stand at the match and encouraged people to donate to Prostate Cancer UK as well as campaigning for men over 50s to attend a screening. We thought it was going to be difficult to get 100 men over fifties to get a screening. Instead, we could have easily have done doubled the number and had to turn people away. The screening itself took place over two days at Burton Albion’s Pirelli Stadium. Thank you to my colleagues Sarah Minns, Tyra Stevens, Aimee Hassett and Kayleigh Marlow who all worked tirelessly throughout. I am also grateful to Deb Price who helped facilitate the campaign with all our partners. Burton Albion was kind enough to let prostate cancer patients be the flag bearers and mascot – to lead the players out on the pitch at the match against Oldham Athletic which had the added bonus of being televised by Sky TV. What an honour for the patients. The other great help was the coverage of the campaign by Burton Mail – we are so grateful for the coverage we received. It makes such a huge difference to all the people who had worked so hard on this project and to get the message out in the community about the dangers of prostate cancer. “Over the week, we have raised in excess of £2,000 and more importantly, delivered our message to more than 5,000 people in East Staffordshire.